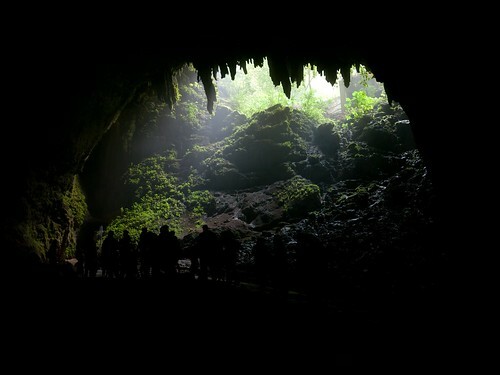 Our last day, we ventured to the Rio Camuy Cave Park, the third largest cave system in the world. 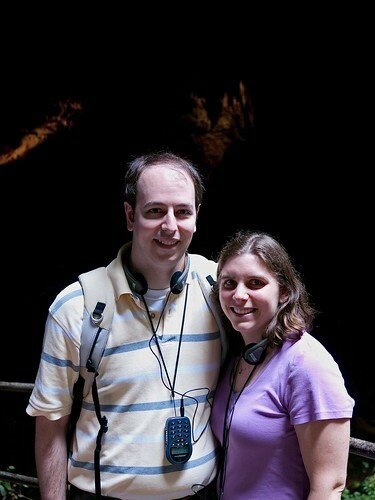 They have a small part of the system open for tourists, so here we are with our walking tour headphones with the cave behind us. 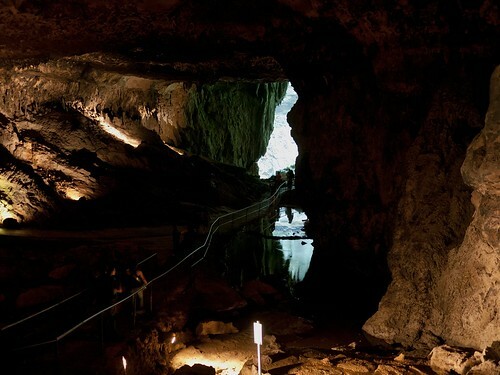 This is taken from inside the cave looking out one of the openings. 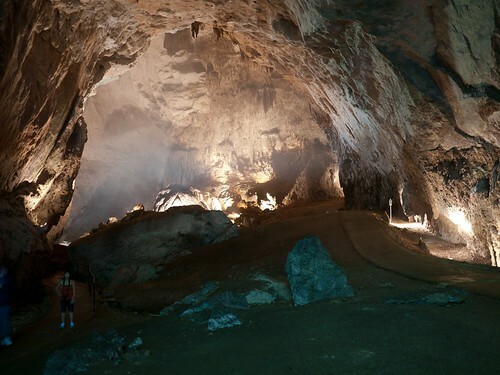 There are actually a lot of openings to the cave, meaning that it is slightly naturally lit. This is the cave as seen when you first enter it. It's really huge. At its tallest, you can fit a 13 story building inside it. 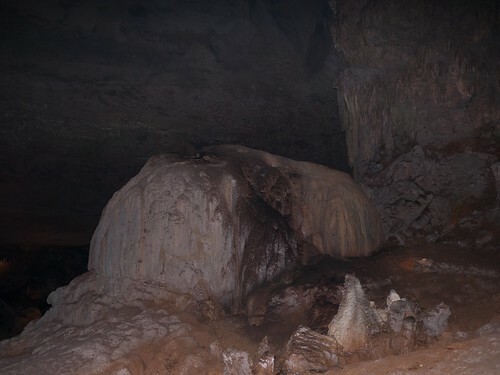 This is apparently the world's largest stalagmite (and it is huge). The cave was very cool to look around. We rented a car to drive to Camuy caverns. That was an adventure in itself! Puerto Rican drivers are very aggressive (turn signals are nonexistent and red lights are optional! ), the driving lanes are very narrow, and on our way to return the rental we had trouble finding a gas station that (a) wasn't boarded up and (b) actually took a credit card! It's nice to be home. 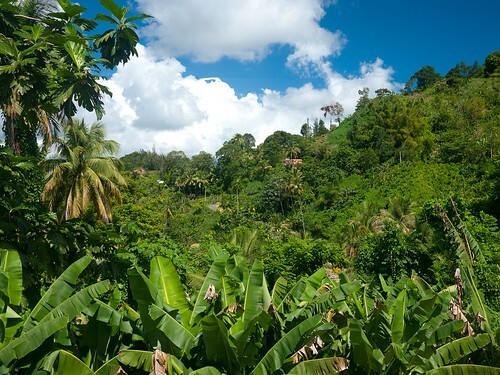 Our biggest adventure was in the San Salvador rainforest. 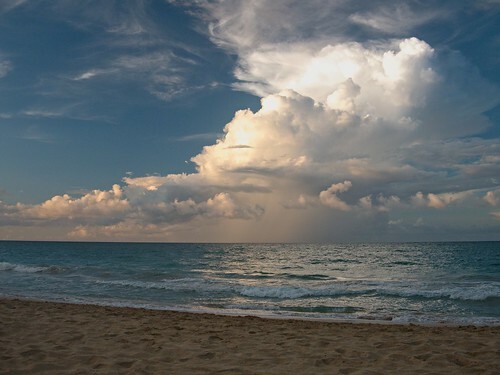 This was my #1 reason for going to Puerto Rico! 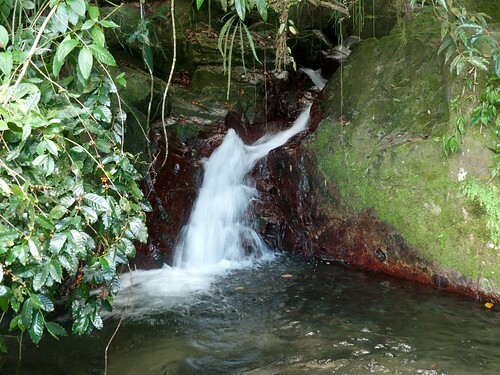 It began with a hike up a mountain stream. Taking a little break to cool off in this little pool along the way up the stream. We had some fun guides. Two of them can be seen here helping me (or not) climb up this rock face. That's Jorgito at the top and Andres at the bottom having fun. 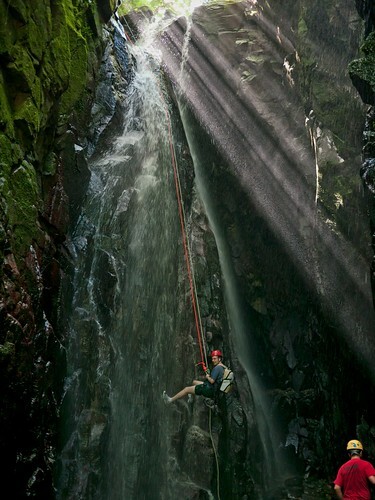 Chad's favorite part of the adventure came next - rappelling down a waterfall. This picture really doesn't do it justice - it was a pretty long way down (80 feet!). Very, very fun. 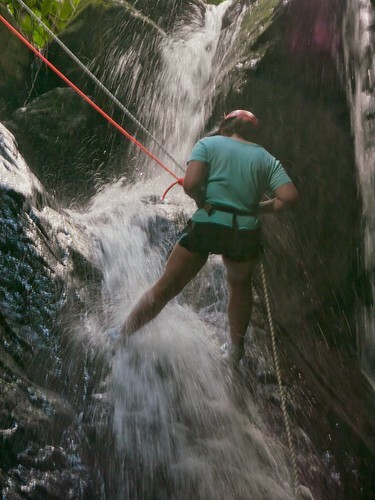 I was the next to come down the waterfall. Here I am near the top just getting started. 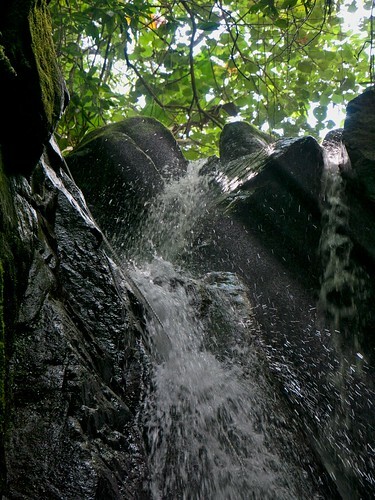 A view of the top of the waterfall. After we repelled down the waterfall, we had a short snack break of fresh mango, wild bananas and oranges. 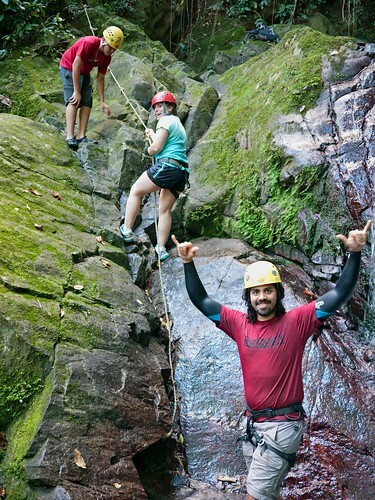 Then we moved on to the last part of our excursion - ziplining! 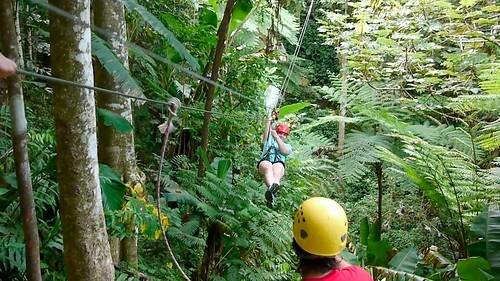 If you didn't catch it already, here is a video Chad took while he was on the zip line, then of me zipping toward him. After the ziplining, we trekked back down the river where we had lunch waiting on us. One of the local families in the rainforest village cooked us an excellent authentic Puerto Rican meal. It was really outstanding! This is the view from the lunch area. 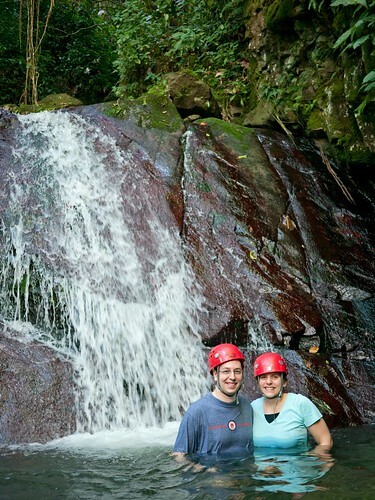 We booked both our kayaking and rainforest adventures through EcoQuest. 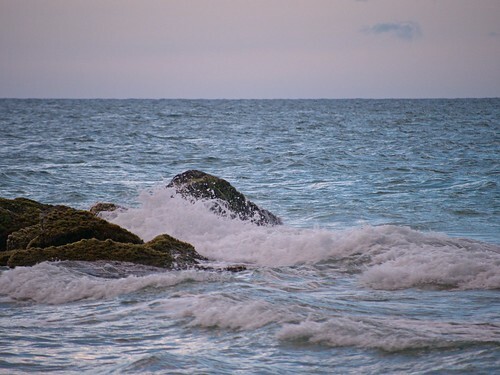 If you are planning a trip to Puerto Rico, I highly recommend them. 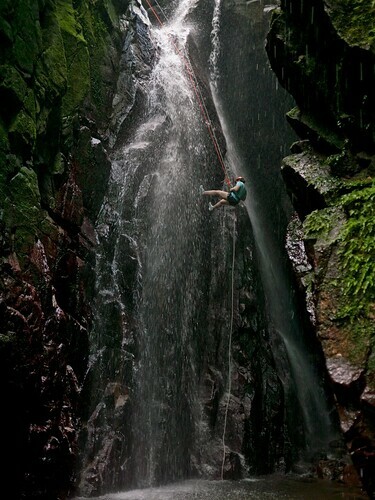 We had a full rainforest adventure while in Puerto Rico. Jen will write more about it soon, but I wanted to go ahead and show a short video of ziplining through the rainforest treetops. The first part I shot while zipping myself, then I shot Jen zipping towards me. Sorry there's not more video, but I wanted to experience the fun fully, so I put the camera away atfer this. 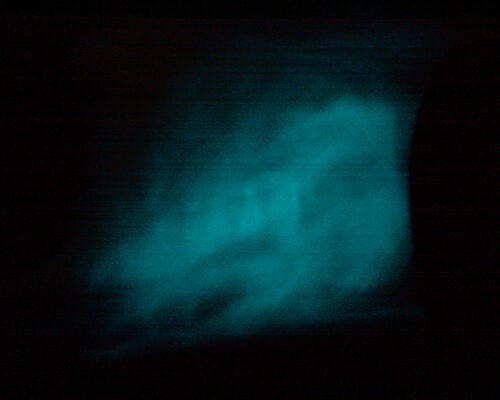 In researching activities to do in Puerto Rico, I came across information about a bioluminescent bay. 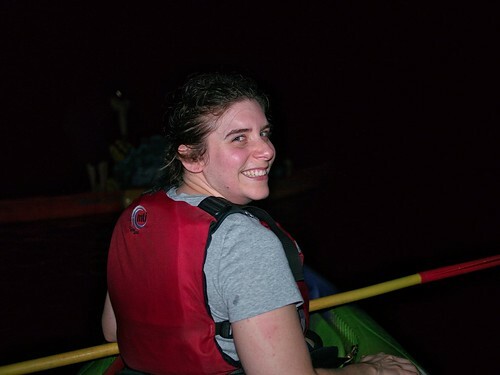 So, our first night included kayaking at night through canals from Fajardo to Laguna Grande. The reason for kayaking at night was because Laguna Grande is one of the few places in the world where you can find bioluminescent microorganisms near the surface of the water. These dinoflagellates glow (like a firefly) in the water when you move it. We made the mistake of going on a clear night with a full moon, but our guides brought a tarp to block out the moon to make it easier to see them. It was really cool. They're virtually impossible to photograph and look more like lots of tiny sparkles than this blur of glow, but this gives you an idea of what we saw. 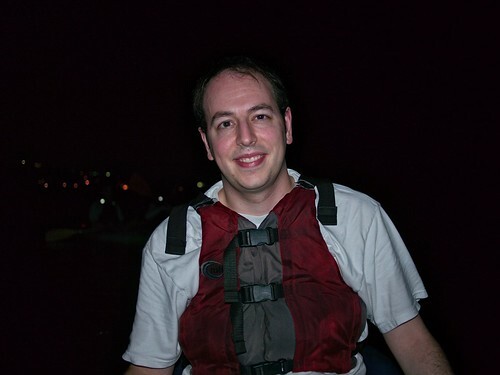 Seeing the glowing particles was amazing, but we really enjoyed the nighttime kayaking too. 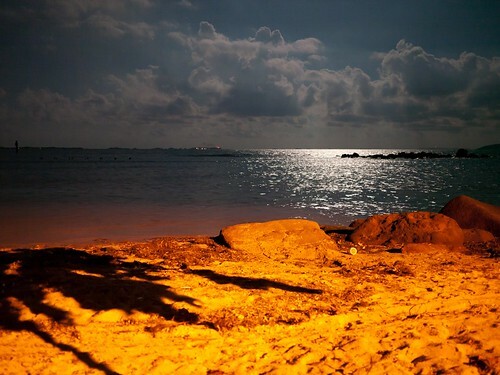 When are you ever going to get the chance to kayak by moonlight?! 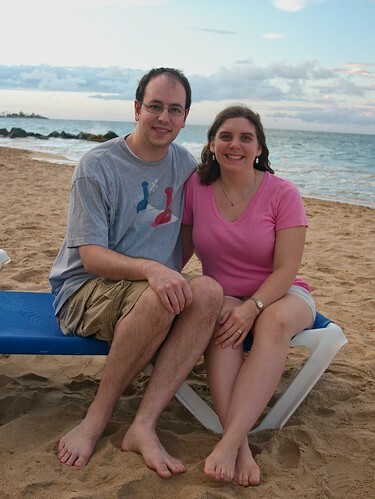 For my 30th birthday/our 8th anniversary, I wanted to go on a big trip sans kids, so we've just returned from spending the past few days in Puerto Rico. 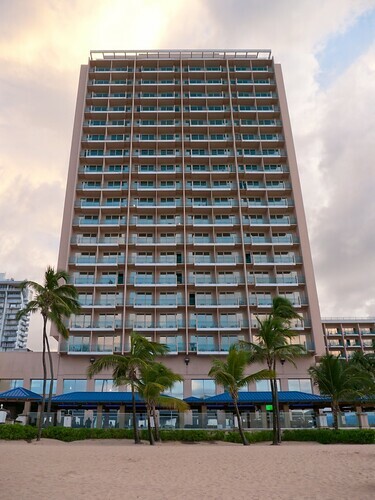 We stayed at the Marriott Resort in the Condado area of San Juan, right on the beach. 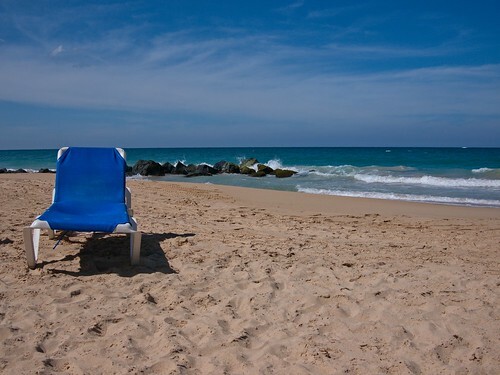 We spent one morning wandering around the Condado area of San Juan. Our main destination was the open air market nearby, which wasn't what we were really looking for, but the restaurant outside was perfect for lunch. I enjoyed a fresh pineapple smoothie (though Chad's fresh mango smoothie was better). We actually spent very little time on the beach, as we're not big beach people. It was a nice beach, though, so we checked out the view and relaxed for a few minutes. 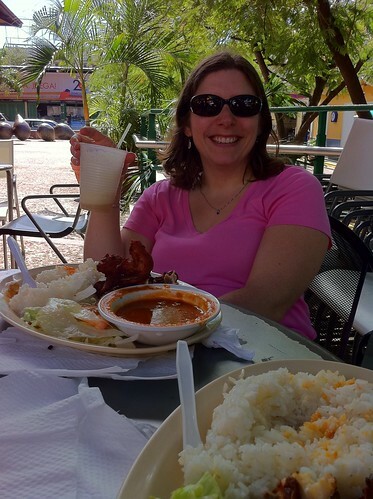 Our best meal was at a restaurant called Ropa Vieja. 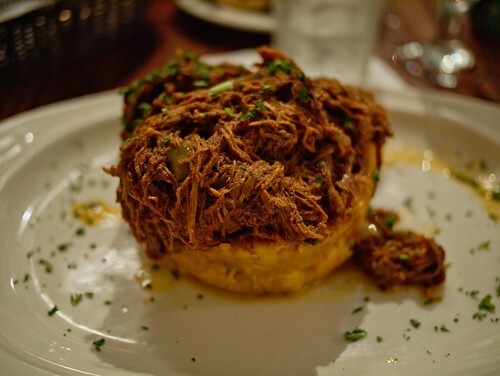 The below picture is of Chad's meal - Ropa Vieja Mofongo. Ropa Vieja is a Cuban dish of pulled beef (it's the top of this). Mofongo is a Puerto Rican dish made from mashed plantains. My Canoa Picadillo (like a banana split, except using plantains and ground beef) and our shared dessert - Flan Queso (like a cross between cheesecake and flan) were great as well. One of the great things about living in a planned community is the number of conveniences available. 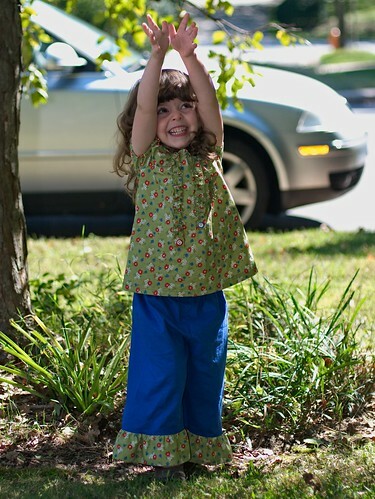 One that Molly has taken advantage lately is the tot lot (aka mini playgrounds) near our house. 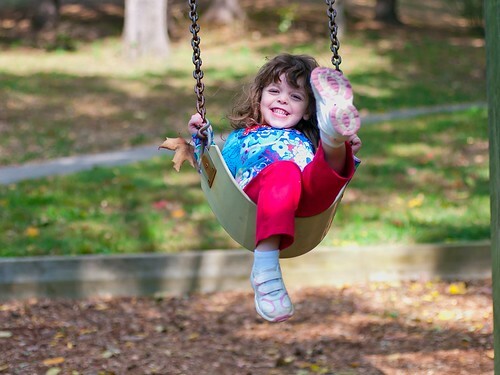 Fall can be a great time to swing and slide. 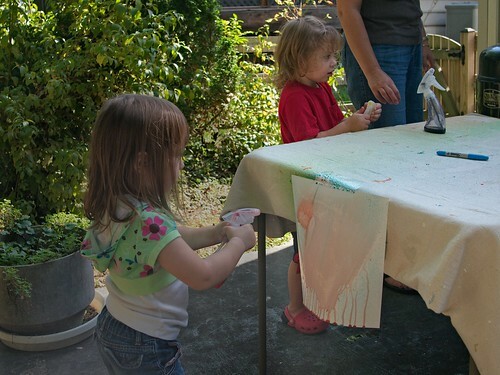 Last week, I hosted a squirt bottle painting playdate. 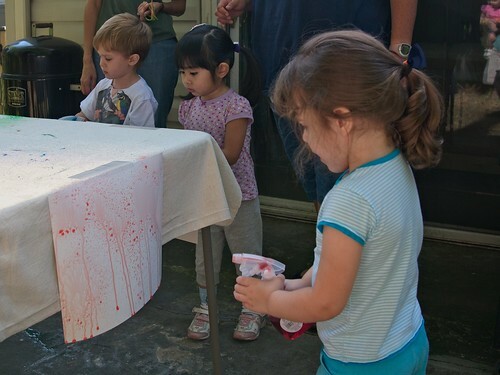 Squirt bottles + colored water + paper = happy kids! They sprayed so quickly that the water didn't really soak into the poster board, but they didn't care! 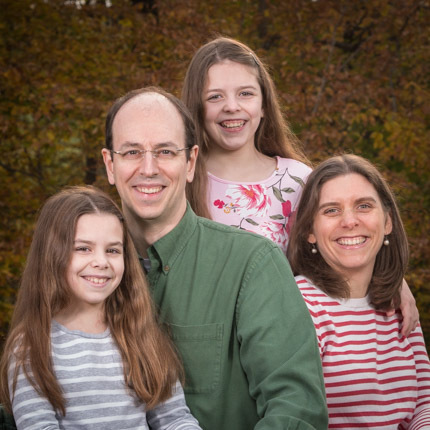 The kids did a nice job of sharing to end up with a nice waterfall of colors. They all had such fun! 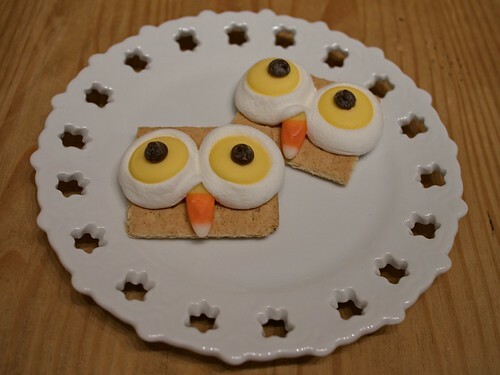 We all enjoyed owl s'mores when the masterpieces were completed. October is Clergy & Staff Appreciation Month. I am a staff liaison at my church, so I was asked to honor a couple staff members with a special gift. 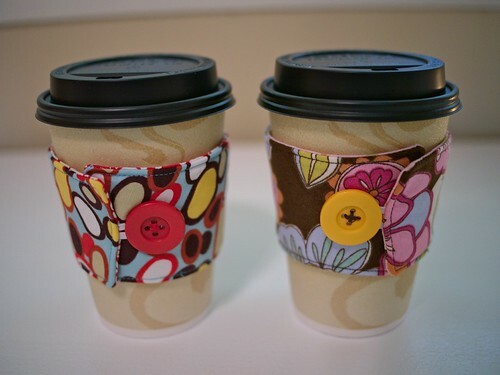 I'm linking up to Made by You Mondays at Skip to my Lou so you can see other crafters' creative ideas. I made Molly a new outfit for the Fall. 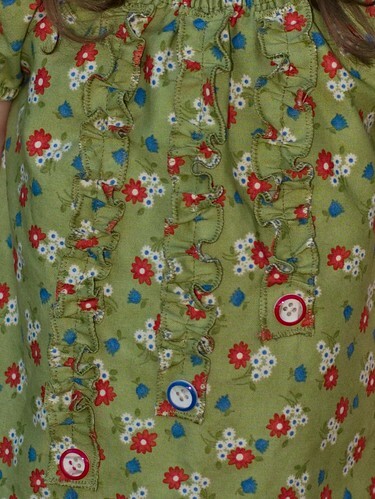 A ruffled peasant top and coordinating easy-fit pants, perfect for wearing tomorrow for "green day" at school! Molly wanted all red buttons, but Mommy won with a blue one in the middle! 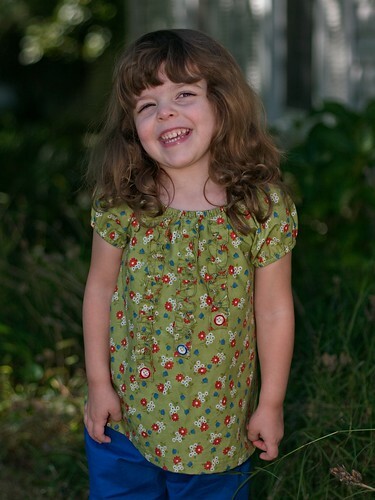 I'm linking up to Made by You Mondays at Skip to my Lou so you can see others' creative ideas.